1. Create a new placeholder text field in the entity. I have added it to the form for testing purposes, but you can either remove it or make the field not visible. 2. Create a dialog which is pretty identical to the example I am trying to imitate: One page for the name, and one page for the Yes/No radio button. 3. 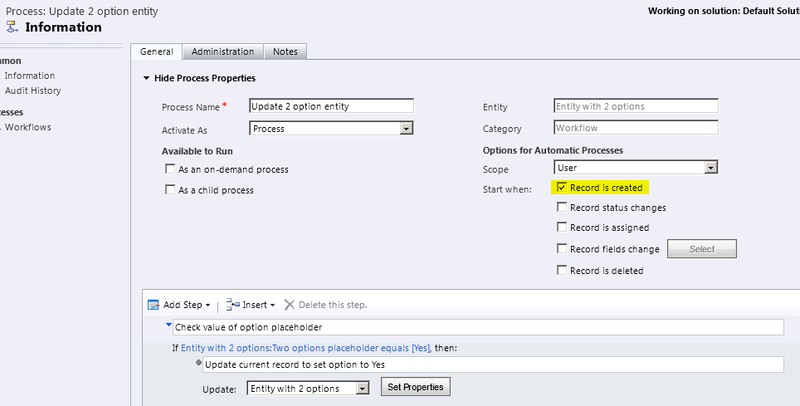 At the end, create a new record, with the Yes/No value from “step 2” being mapped to the placeholder field in the entity. 4. Create a new workflow for the custom entity, which triggers when the record is created. 5. Add a check condition to evaluate the placeholder value. If value = “Yes”, update the current record two option value to “Yes”. Kick off the dialog and test it out. 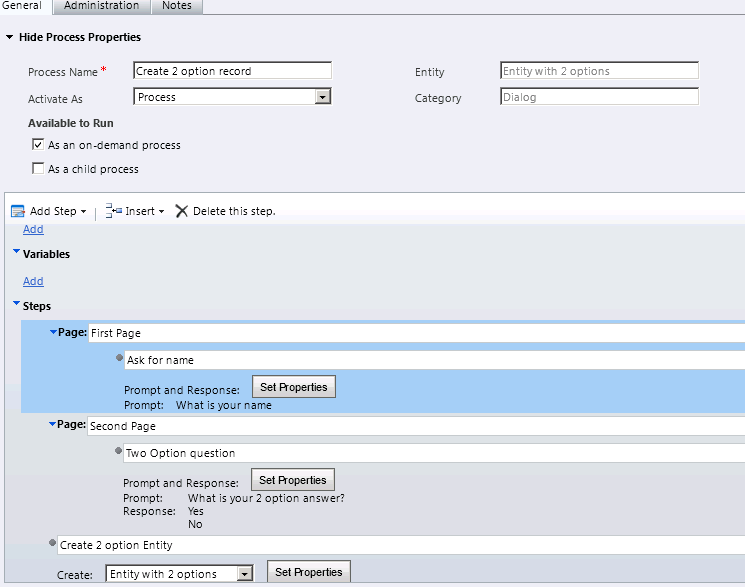 You will see that the option value is set based on the selection from the dialog page. The value is set only if the user opens up the form. If there is no manual intervention, the option value stays incorrect. Not good news for your views and reports! The user, even after opening the record, could close out the form without saving changes. You are back to messed up views and reports that use incorrect data. Final Thoughts: I think the post by @devkeydet is the most elegant solution of them all. But if your options are limited with respect to resources, using the placeholder and workflow UI could be an option.